Update Hamburg: dezentralized infrastructure on site! | Vive le sabotage! Good news for the protest against the G20 in Hamburg: the necessary infrastructure for the resistance is on site. While there was a huge focus on all the bullying and attacks of the cops, while they are still trying to block camps, what is working succesful went out of sight. This overview shall give an orientation in the dezentralized structure in Hamburg and motivate all to come here. Those who are traveling to Hamburg is in between all the blue light and zones heartly welcome. Because the situation is much better, than most of the news are showing daily! There is right now not only one central camp. Which does not mean that there are no sleeping places. Instead of it there are a lot of little campsides, private appartments and upgrowing number of locations that give space to the people like Schauspielhaus (theatre). Who is cooming to Hamburg and does not want to sleep on the street, will find definitly a sleeping place over a good functioned network! This is reachable over the number +491639273427 and +491746204211 (updates also on #schlaflos_in_hh). Furthermore at every Infopoint you can find informations about sleeping places. There are many streetmaps and action-maps, that the local structures are providing. All the maps are marking the locations of the lefties infrastructure. A good online map for friday actionsday (and more) can p.e. found here. At the place there are also printed informative actionmaps for the “Welcome to Hell”-demo. This one is also marking places to recover (out of action). On the maps are also the numbers of the legal team and the first-aid team. It’s always a good choice to reach a infopoint and get a map. Spreaded over many districts of the city well functioned infrastructure can be found. Besides the well known places like Rote Flora, Centro Sociale or the campus of the university many more other spots can be reached. At all infopoints you can mostly find a PC and a screen with liveticker. There are also printed infos and maps, mostly warm and cold beverages and cold beverages and food. The locations are well frequented, because there are already lots of activists in the city. Whereever you are sleeping and being activ in an Infopoint is almost close. Online you can find an overview of addresses of the infrastructure. Included are also exclusive spaces and recovery areas for FLTI*. Many action-kitchens came to Hamburg and are cooking as hell. The food is either served at the info- and out-of-action-areas and/or directly at blockades and assemblies on the street. Alltogether there is kitchen for many thousand people, nobody will be left hungry. 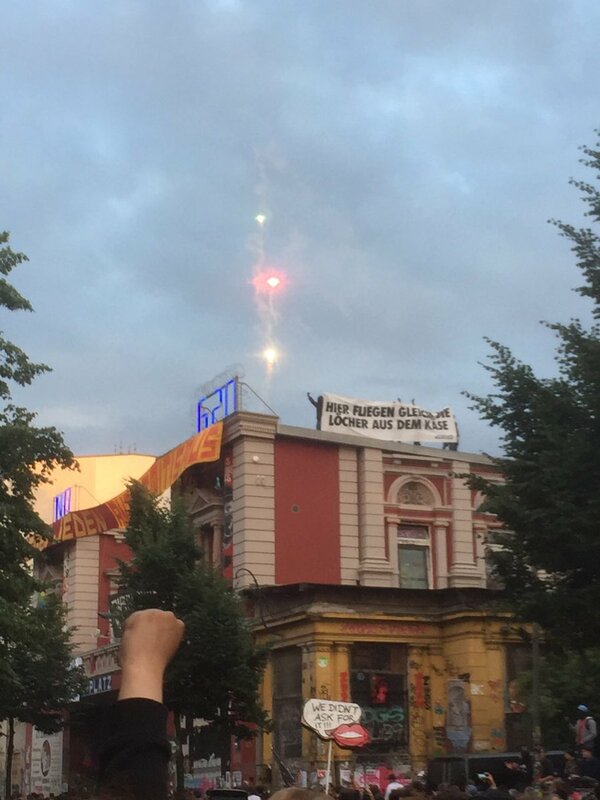 There are various Ticker like from the taz (german newspaper, taz-ticker) to the independent media center FC⚡MC (#) and a potpourri of everything on #nog20. Who does not want to use internet, can find informations at the local free radio (FSK), that is also played at the infopoint and some keyosks/bars in the city. Don’t get irritated from alarming tweets or the media: the local scene is best prepared, the vibe is good, the city is full of sympathic militant left people. The infrastructure in place is very stabil and many people are prepared. Who is coming to Hamburg, will not be alone, the dezentralized structures are welcoming you like hell.